While the Pope marked his adopted feast with a surprise visit to quake-ravaged Rieti, this St Francis' Day has brought a double shifting of plates in the top ranks of the Stateside church. At Roman Noon, Francis tapped Bishop Paul Etienne (above) – the avid outdoorsman who's reveled in the "smell" of Wyoming over seven years at the helm of its statewide diocese of Cheyenne – to another sprawling pioneer's paradise, elevating the 57 year-old to Alaska's lead post as archbishop of Anchorage. At the same time, months of anxiety in Raleigh have surprisingly been realized as Bishop Michael Burbidge, 59 – the USCCB chair for clergy and religious, who's brought the 500,000-member North Carolina fold to the threshold of a new cathedral set to open next July – has been transferred to the outskirts of the nation's capital as the fourth bishop of Arlington. In both cases, the moves infuse their respective locales with a fresh dose of energy – both a year past the retirement age of 75, retiring Archbishop Roger Schweitz and Bishop Paul Loverde have each held their posts since the turn of the millennium. 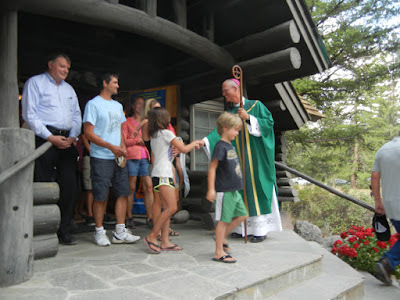 Both dioceses likewise face intense challenges of scale: in Anchorage, the 140,000 square-mile spread makes for a daunting haul much of the year, as a crunch of priests has seen Schweitz – who pilots his own plane to cover the stops – pitch in by taking the full-time pastorate of a parish on top of the wider role. In Arlington, meanwhile, the ongoing growth of Washington's Northern Virginia suburbs hasn't merely doubled the size of the diocese since 1990 toward the 600,000 mark, but in the process yielded a Catholic population coming ever closer to a Hispanic majority. A son of rural southern Indiana, Etienne (pron. : "A-chen") hails from an almost-storybook ecclesial clan: one of six siblings, three became priests, and his sister is a Benedictine. For his part, the archbishop-elect's vocation had its fits and starts – needing a break from the seminary, the future prelate managed a shoe-store before his first brush with church officialdom as a lay employee of the US bishops in planning the mammoth Papal Visit of 1987, when John Paul II cris-crossed the country for two weeks. A fly-fishing rod ever tossed in the back of his truck – and tipped as a rising star from the get-go – the boyish bishop has brought Wyoming two qualities that are exceedingly difficult to pull off for a statewide fold spanning 100,000 square miles: cohesion and action. While interminable hours behind the wheel to reach every place went a long way toward doing the trick, technology's provided a useful assist, with Etienne taking to a blog (and, with time, a Twitter feed) that, beyond keeping the locals updated on his travels, often veered into reflections on prayer and things in the news. This morning, with the nominee said to be "shaken" over the move, the new archbishop's page carries a simple message to Wyoming: "I love you." 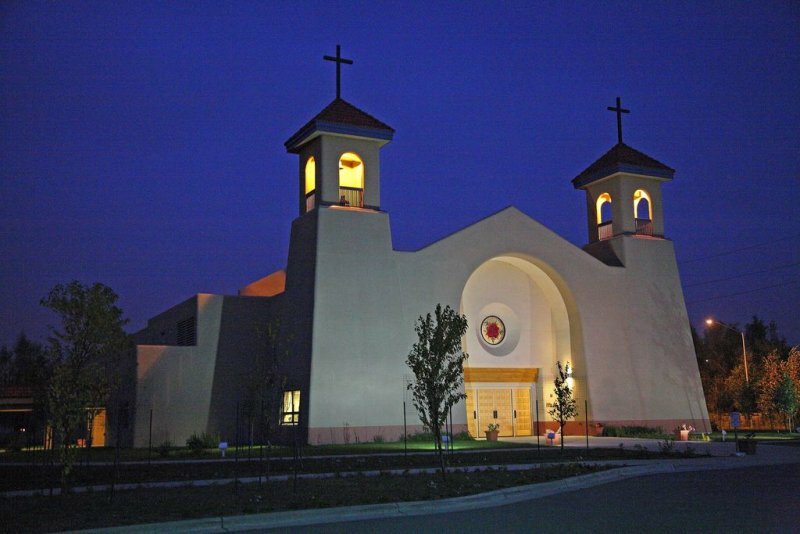 Though Anchorage's Catholic population of 35,000 is relatively small, it has grown markedly over recent years, with a sudden influx of Latinos becoming a priority for ministry. In light of the uptick, in late 2014 Schweitz moved the the archdiocese's de facto seat from the cramped Holy Family Cathedral downtown to one of the city's newer parishes, Our Lady of Guadalupe (above), designating the ample church as his co-cathedral. Etienne will be installed there, with an early November timeframe in the works – the usual appointment day presser is slated for 11am local time/3pm ET. As for the fourth bishop of Arlington, it's a sign he'd appreciate – word his appointment set off some rather remarkable flights of eyebrows up and down the East Coast. Indeed, it's an unwritten rule that a bishop engaged in building a cathedral is not to be moved until it's dedicated (and, preferably, paid off). 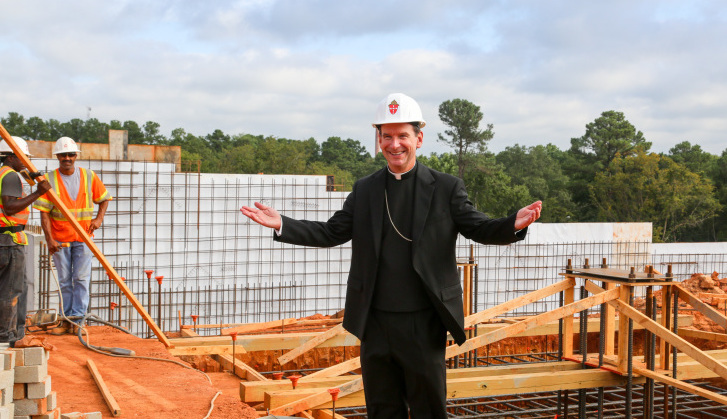 Yet after a decade that's seen Raleigh nearly double in size, exponentially increase its number of seminarians, make significant strides at serving the Hispanics who now comprise roughly half the diocese – and its bishop elected to lead the US bishops' arm for clergy, religious and vocations – an infinitely more charged assignment with similar needs and challenges apparently could wait no longer. Along those lines, history's repeating itself – before Burbidge, the last time the rector of Overbrook had been a bishop, he ended up in Arlington, too... yet while the latest of the line doesn't share Tom Welsh's penchant for weeping openly, it'd be a surprise if he didn't shed a few tears over this. In any case, given the NoVA diocese's firm bond with St Charles Borromeo Seminary from the very founding of the Beltway church, this move has the makings of a family reunion to it. A diocese whose core is overwhelmingly comprised of DC commuters and government or non-profit employees, Arlington has long enjoyed a reputation as a bastion of conservative Catholicism, both ecclesiologically and in terms of its secular politics – not for nothing was the late Supreme Court Justice Antonin Scalia (father of the diocese's clergy-personnel chief) fittingly the local church's most celebrated and revered member, ordained or lay alike. Even if the long-awaited appointee certainly fits the bill on that front, it bears noting that the descriptor is not as maximal as some might seek (or fear) it to be. To cite but one recent example, after national controversy erupted over the North Carolina law restricting transgender access to their preferred restrooms, in early May Burbidge issued a conciliatory statement drawing back a prior show of support for the measure, and urging – as the church's lead advocate in the state capital – that "another remedy" be found, one which would "defend human dignity; avoid any form of bigotry; respect religious liberty and the convictions of religious institutions; work for the common good; and be discussed in a peaceful and respectful manner." In the final analysis, he said, "no person should feel as though they are unwelcome in our communities of faith." Having long advocated the solid coordination of bishops across diocesan lines – above all when they share a media market – today's move bears the quiet yet palpable imprint of Burbidge's new neighbor across the Potomac: Cardinal Donald Wuerl of Washington, now the East's principal architect of the docket from his seat on the Congregation for Bishops. 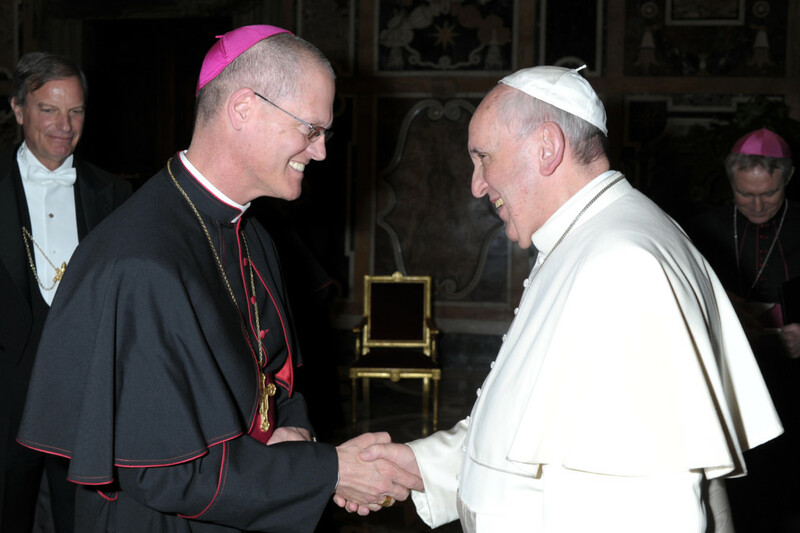 In a markedly ebullient statement released shortly after the appointment was made, Wuerl lauded the Pope for "once again show[ing] his love and care for the Church in our Country" with the Arlington pick. 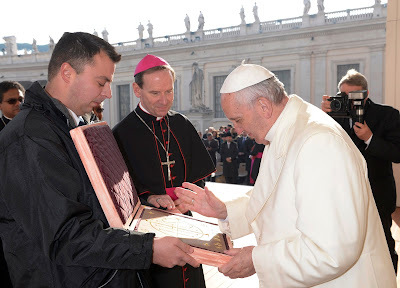 "With joy we receive this news," the cardinal said, seeing "in Bishop Burbidge a shepherd of the flock who possesses great zeal and has long demonstrated his love for the people entrusted to his pastoral care." Truth be told, however, the Michael Burbidge now returning up I-95 is a changed man from the one who left the only place he ever knew a decade ago. Back then, Philadelphia might've sent Raleigh a bishop... but it took the newness, challenges, energy – and, indeed, honesty – of a living church to make the pastor who now heads back North. Even if a rising cathedral captures the work of these years in stone, the crafting of its builder is no less striking a result. And despite being taken from the Triangle before he could enjoy the fulfillment of his efforts, the Dedication Day honors next July 26th will be his nonetheless, as they should be, the successor only to emerge after that point. Burbidge will be installed in Arlington on Tuesday, 6 December – in the meantime, he's slated to stick around to celebrate the Noon Mass tomorrow (5 October) in his soon-to-be Cathedral of St Thomas More.